Lehigh students hike through the warm grass meadows at the Palmerton Superfund Site, visiting the site as part of a class. Photograph courtesy of the Lehigh Gap Nature Center. The New Jersey Zinc Company founded the town of Palmerton in 1898 to house employees of their zinc smelting operation. From 1898 to 1980, an estimated 33 million tons of residue from smelting, including cadmium, lead, zinc, and sulfur dioxide, were released into the environment. These chemicals saturated the soil and air, accumulating in the soil to the point where vegetation was inhibited, and the health of residents was compromised. The passage in December 1980 of the Comprehensive Environmental Response, Compensation, and Liability Act (CERCLA), often known as Superfund, imposed a tax on chemical and petroleum industries. This tax goes into a fund for cleaning up abandoned or uncontrolled hazardous waste sites. Palmerton was identified and placed on the National Priorities list by September 1983, in dire need of clean-up. The Lehigh Gap Nature Center, a non-profit organization, purchased over 750 acres of polluted land and barren mountainside in 2002. Dan Kunkle, executive director of the center, and other members worked with state and federal environmental agencies, as well as the corporate owners responsible for the clean-up of the Palmerton site, to secure funding to restore the land. 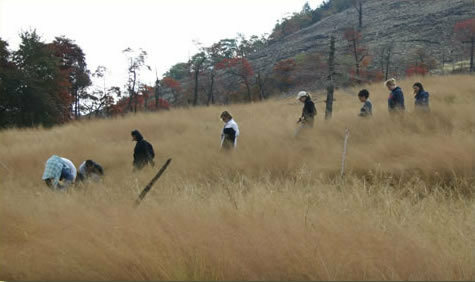 They have introduced native, warm-season grasses to successfully start re-vegetation of the site. The Lehigh Gap Nature Center has worked with STEPS faculty Alec Bodzin, Steve Peters, Kristin Jellison, and Lehigh students interested in the transformation of Palmerton's environment.